Chevy Chase Beach Cabins is the perfect location for gatherings of friends and family, intimate celebrations, and small business retreats. We have hosted family reunions, birthday weekends, writers' workshops, painting retreats, business conferences, knitting groups, restaurant staff getaways, wellness retreats, and yoga workshops. The clustered cottages and the beauty of the property are conducive to celebrating, recharging, team-building and connecting. All events are unique and we like to give each gathering our utmost personal attention, regardless of size. Please contact Jenn for detailed information about rates, policies, and endless possibilities! Interested in hosting a WEDDING at Chevy Chase Beach Cabins? Please visit this page. To view more PHOTOS of events hosted at Chevy Chase, please visit Jeff's photography website here. Many family reunions, birthday and anniversary celebrations, and holiday parties take place at Chevy Chase every year. Groups of family and friends can rent a cluster of cottages or the entire property and share meals in either the Clubhouse or Homestead cabins. We are happy to provide spare tables, chairs and dishware to the host cabin with prior arrangement. Unplug, re-connect and watch your family and friends bond while taking advantage of our ameneties: play outoor lawn games, have bonfires on the beach or by the gazebo, enjoy quiet reflection and conversation on a deck with spectacular views, and spend a relaxed evening in front of the fire. Space can also be rented in the historic Victorian home for special celebrations. The intimacy of our property inspires connection and is perfect for team-building retreats, business meetings, and workshops. 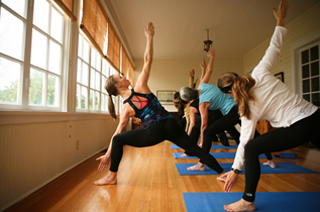 Our space is flexible and can accommodate a board meeting or a row of yoga mats! Participants can bond in shared accommodations, feel stimulated and motivated in our beautiful setting, eat meals together in one cabin and move to another cabin for a focused meeting or team-building session. Space can also be rented in the historic Victorian home for a conference, special presentation, or catered meal. Our staff is happy to help with event coordination and catering, assist with lodging details, create beautiful floral arrangements, and facilitate audio-visual needs for your group. The entire property has wireless internet. How many guests can you accommodate in all seven cabins? How much does it cost to rent all seven cabins, and do you discount for a full property rental? Where can my group gather together for meals, meetings, etc? Do you rent space in the beautiful white Victorian home on the property? How many guests can the Victorian home accommodate for meetings, events and parties? How much does it cost to rent the Victorian home for an event? Do you ever rent out bedrooms in the Victorian home? --At maximum capacity, all seven cabins can sleep 30 people total, but that is cozy. That means there are two people in every full/queen/king bed, and all "extra" sleeping surfaces (ie: futons, daybeds and pull-out couches) are used as well. "Real bed" capacity (with two people in each full/queen/king and one person in each twin) is 24 people. Please note that there is an extra charge of $20/nt for each guest beyond the "real bed" capacity in the cabin. --There are 14 beds total between the cabins (19 if you include futons, daybeds and pull-out couches) if each person in your group needs their own bed, but not necessarily their own bedroom. --There are 12 bedrooms total between the cabins if each person in your group requires their own bedroom. Additional charges include 11% tax, pet fees and extra guest fees. Sorry, we do not extend discounts to groups who are renting multiple (or all) of the cabins on the property (unless, of course, you are taking advantage of an advertised special). While we love hosting groups, it tends to create more work for our staff and adds extra wear and tear on the cabins. The Clubhouse Cabin (the 2-bedroom cottage on the bluff) has the best layout for cooking, eating and meeting as a group. The floorplan is open and the furniture can be re-arranged to accommodate extra tables and chairs, which we can provide as needed. There are dishes, flatware and glassware for twelve in the cottage, and we can leave a basket of extra place settings depending on the size of your group (so you don't have to "borrow" from the other cabins). Groups of 20 have had meetings and shared meals together in this space and been comfortable. The Homestead House is also conducive to group gathering, though the interior space is a bit less flexible than the Clubhouse and can't accommodate quite as many extra people. A group of 14 could share a meal or use the Homestead House as meeting space and feel comfortable. The beautiful white Victorian home on the property was originally Chevy Chase Inn. While it is currently the private residence of the owners, space on the ground floor is available to rent on a limited basis. The sunroom/dining room has sweeping views, the two parlor living rooms are spacious, tastefully decorated and comfortable, and the immense kitchen is a caterer's dream. Because it is a private home, we are selective of the events that we are open to hosting. For every potential gathering, we request a lot of information to make sure our property is a good fit for both parties. The Victorian home can accommodate a maximum of 50 guests for sit-down events. Please inquire about capacity for larger stand-up cocktail parties and outdoor only celebrations. Please inquire for a current price structure. 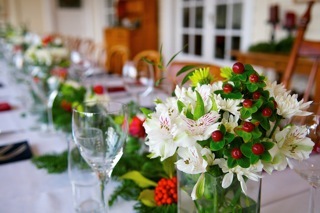 Every event is unique and the cost varies widely with many factors taken in to account: time of year, time of day, number of cottages rented, number of guests, kitchen use, set-up and clean-up requirements, and resources utilized (tables, chairs, linens, dishes).